Purchase a re-conditioned Dyson here at a fraction of the cost!!! Essex were beaten 27-12 away at Yorkshire, both Ladies & Men's A earning well deserved draws... Essex remain 7th with one fixture remaining, home to Cheshire at the end of April! Essex’s John Weller has been recognised for his contribution to the sport in his role as a BDO official. 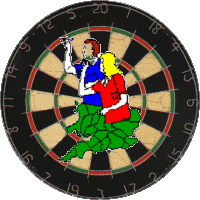 John has been an integral part of Essex County Darts for over thirty years, currently holding the position of General Secretary. John, along with his wife Mandy, have run the merchandising stool for the BDO since 2000, culminating in John joining the BDO board as the Merchandising Director in 2013. Through John’s ongoing commitment to the sport and his dedication to the merchandising sector, the BDO have benefited from the sales and have been able to offer on-going financial support to the British Youth teams. John made the decision to step down from his role within merchandising after nearly 20 years, although he remains at the helm in Essex, and we would like to thank him for all his years’ service and wish him every success in the future. Please e-mail me new link!